If you read our session reports regularly you will have noticed that "Liars Dice" or "Bluff" as it is called in Germany, is one of the games we play very often to close an evening of gaming. Short bluffing games like this are perfect to end a session of serious gaming. At Essen 2003 Kidult released "Coyote" by Spartaco Albertarelli. "Coyote" is a card based bluffing game which at the time was somewhat overlooked maybe because of its rather children game looks and some problems with the production quality. 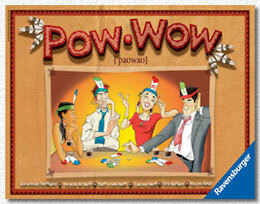 This year, Ravensburger re-released "Coyote" with improved material, some rule enhancements and a new name: "Pow Wow". 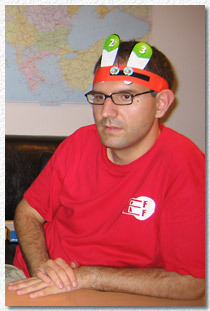 The game contains headbands for eight players, a set of cards with a positive or negative number between -5 and +10 printed on them, some special cards and three special option chits per player. The "cards" come shaped as feathers, which helps in creating a relaxed party atmosphere but pose some handling problems when shuffling. if the sum is higher, the previous player gets the token. Once a player has received his third vulture token he is out of the game. The special feathers create a lot of uncertainty and chaos as some of them eliminate the highest valued feather while others double the value of all positive numbers. This chaos is somewhat compensated by the fact that feathers are only shuffled back into the stack when the black "0" valued feather has been drawn. Therefore, a good memory and some card, eh… feather counting helps in detecting bluffs. to change the direction of the round. These chits add a bit of a tactical component to the game and timing of their usage is critical. While "Liars Dice" is a bluffing game for gamers, "Pow Wow" is more a party game with bluffing as a theme. The chaos factor is pretty high, even when counting cards and using the special chits, and was not liked by our group. Played with the right group of at least 5 people that are in the right mood for some fun and chaos and who don't take themselves too serious this is a perfect starter or closer of an evening of gaming.